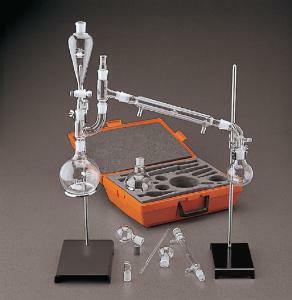 With this excellent set of glassware, your students will have everything they need to carry out basic operations in organic laboratory work. Connecting parts have standard tapered joints (19/22) that allow students to complete setups in about half the time, and eliminate the need for corks and rubber stoppers. The quality glassware is supplied in a sturdy case that is easy to handle and convenient to store. A booklet provides useful information on the care and use of the apparatus.